In our neck of the woods, it's still warm enough to wear a swim suit even though brown, crispy leaves are steadily falling from the trees outside. Ironically, the temperature of the ground has dropped so that it's not comfortable to swim in any body of water (except a heated swimming pool), but a sunburn is plum guaranteed if you spend too long outside without sun protection. The sun is still very, very intense. When it comes to fashion, I'm presently trying to balance my seasonal clothing preferences (I own more sweaters than pairs of shorts. No, I don't know why, but it's 100% true!) and what actually makes sense for our climate, and it gets a bit confusing at times. Myself along with lots of other folks here are dreaming of the the fall weather, but still having to cope with the crazy heat so the standard weekend attire becomes something along these lines: a long sleeve cotton tee (in festive fall colors, of course! ), shorts or a skirt, flip flops and sunglasses. Each and every year, I love to look at the classic, fall pictures that circulate on social media. You know the ones of the brilliant, multi-colored leaves on big trees and the cozy-looking people wearing scarves that surround them. I seriously get caught up in the gathering romance of cooler days that other parts of the country are already experiencing. But, it always takes those blustery, chilly days a bit longer to travel way down here. Before December, we'll have a "cool snap" or two, but then the heat always rises again and sores back into the nineties. It just takes a few tries for those amazing, brisk days to stick in South Texas. I certainly can't control the changing seasons, but I can get into the autumn spirit in my kitchen and lately I've been making lots and lots of soup. I'm a big fan of soup year-round anyway, but Evan gets a bit testy when I start on a soup-making streak "because it's too darn hot for soup". My rebuttal is always "well, anything you eat is going to be hot! (or at least very warm)" So, many of our hot meals recently have been some kind of soup or chowder, which is typically served with some wonderful, crusty, buttery bread or a warm sandwich (grilled cheeses for the win, y'all!). I think many of those lush autumn pictures I adore are snapped up in New England where, I hear, their dramatically shifting seasons and picturesque landscapes are greatly revered. I've not visited any of the north eastern states that make up New England yet, but I sure do like their famous-style of creamy, clam chowder. 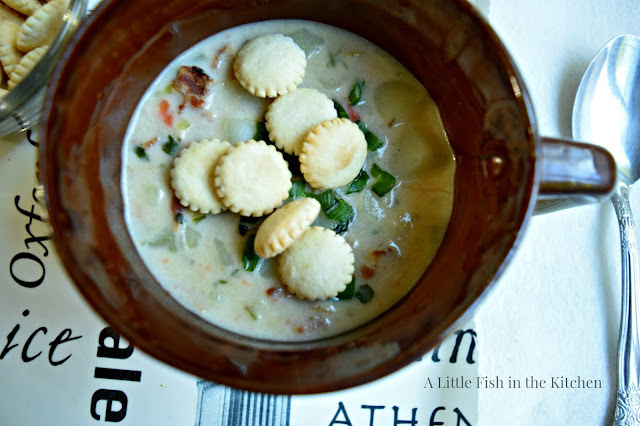 Obviously, I've only had local interpretations of a classic New England-style clam chowder at restaurants and just a few years ago I started tinkering around and began making my own. I'm fairly certain mine would not be considered "traditional" because I add some diced carrots, celery and bell pepper, but I can assure you all that it is very tasty. I hope you all had a Happy Halloween! We had a lot of fun at the locally-sponsored "Safe Halloween" function in our neighborhood. Each year our little municipality does a beautiful job with sponsored events and hosts big celebrations for Easter, Halloween and Christmas. It was truly a party and I'm pretty sure they rented every, single bouncy house structure they could find in the vicinity. There was also a costume contest and lots of games set up for kids of all ages, all supervised by resident volunteers. Oh, and of course there was lots of candy! My superheros, Superman and Owlette, had a blast and boy did they sleep well. 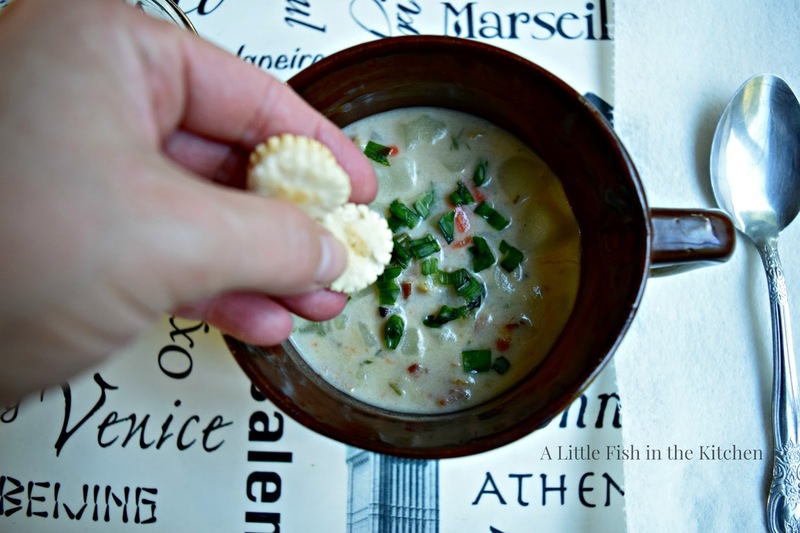 If you're a fan of traditional, New England clam chowder, I'm sure you will enjoy a big bowl of this comforting, veggie-loaded version. Using a Dutch oven, sauté the bacon until crisp. Remove the crispy bacon pieces from the pan and reserve 1/4 cup of the bacon drippings. Discard the rest of the drippings. Add the reserved drippings, onions, potatoes, carrot, celery, and bell pepper to the pan. Sauté the vegetables for about 4 minutes, add the salt, pepper and parsley. Sauté for about 2 minutes more. Sprinkle the cornstarch or flour in with the vegetables and stir until it's all combined. Add in the clam juice and water. Bring the pot to a boil and then reduce the heat to simmer. Simmer for 25-30 minutes or until vegetables are tender. Add in the clams with liquid and the cream or milk. Bring liquid back to just a simmer for about 5 minutes (don't boil or the clams will toughen up). Adjust the season to taste and serve hot. Enjoy! This flavour-packed soup would be perfect for the rainy windy weather we have right here...so creamy and warming! 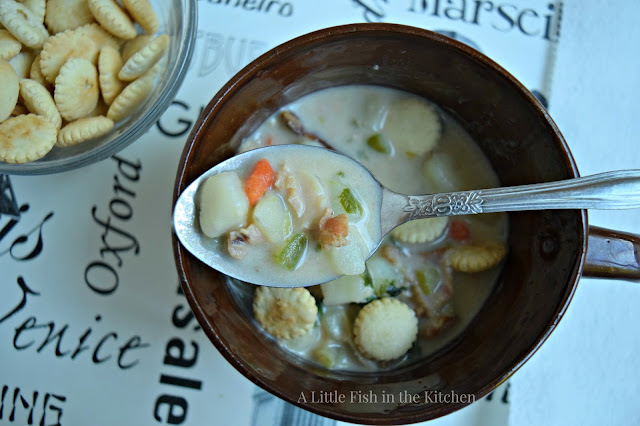 My mom always served those mini oyster crackers when we had clam chowder! Yours looks ultra creamy and delicious! I love soup anytime of the year and most days, my husband not so much so. Lovely soup Marcelle, love those crackers a must have with clam chowder. Hi Grace! I know lots of other people who aren't clam fans or fans of much seafood at all. :) One of those love or hate ingredients, for sure. Our grandkids were wiped after Halloween too :) So much excitement! Love you little super heroes ;) Your clam chowder looks delicious and it's soup weather here. Hope you can start wearing your sweaters soon! Marcelle - I love this, as it reminds me of my family. My parents were both from New England, and clam chowder was served all the time – summer, fall, winter, spring. Now that I live in the southwest, I enjoy the occasional photo of the fall foliage, but for the most part I'm happy being warm in the beautiful sunshine! 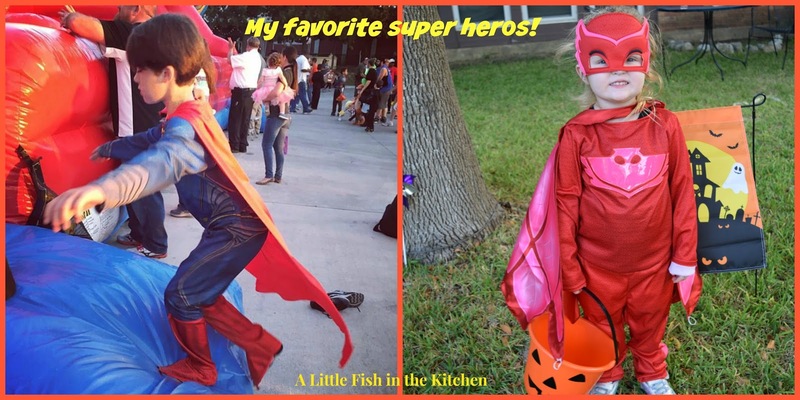 Your Super Heroes are so cute! And this chowder looks superb! 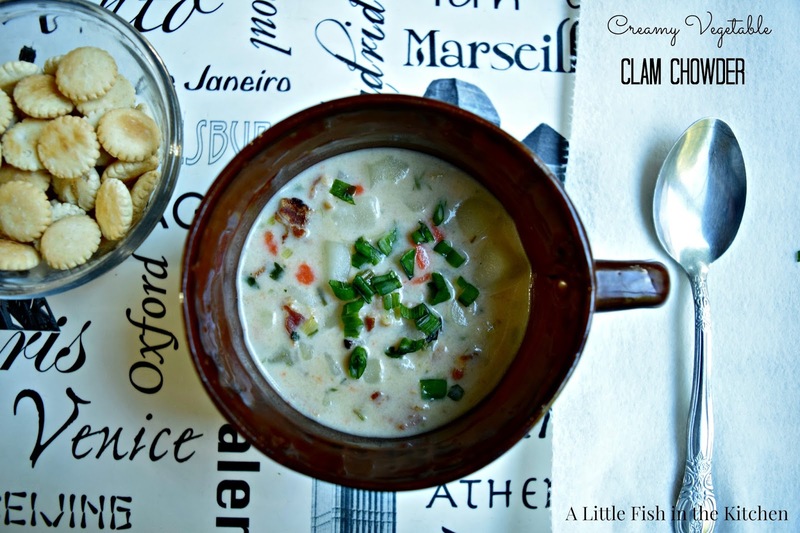 Love clam chowder, and you've really added some nice flavor to yours. Thanks! We are certainly not wearing swimsuits here in Toronto! But we are experiencing some of the perfect fall days you describe. I think your chowder would be wonderful any time of the year. Your clam chowder looks delicious. Love that you use vegetables in it. Great way to get the little one to eat more veggies.